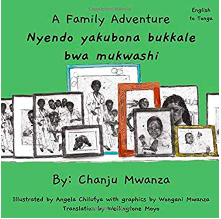 Bilingual Children’s Book Available in Bemba, Nyanja, Tonga, Luvale, Lunda, Kaonde and Lozi. This is the first product of the Zambian Narratives Project that seeks to get Zambian stories down on paper and encourage the next generations of Zambians to keep our languages going strong! 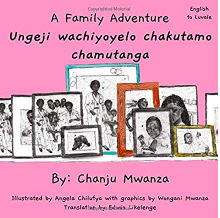 A Family Adventure is a bilingual children’s book that explores family vocabulary and challenges gender stereotypes through images of daily life in Zambia. The book is available in the seven national languages: Nyanja, Bemba, Kaonde, Lozi, Tonga, Luvale and Lunda. I was in Zambia going from bookshop to bookshop looking for a bilingual children’s book in any of the Zambian local languages for my niece. My search was futile, and so I turned to the internet, searching far and wide for a Zambian bilingual book. Again, there was nothing. And so began my quest to create bilingual children’s books in local languages with images that kids both in Zambia and the diaspora could relate to.